Whether you live in Australia or are visiting for a vacation, Sydney will almost surely overwhelm you if it’s your first visit. There’s just so much to see and do that unless you are in the city for a very long vacation or have simply moved there to work or study, there’s just no way you can cover it all. To help those who don’t particularly plan to spend weeks in the city, we have prepared the following list of three things that every first timer must do at least once before leaving Sydney. The Sydney Opera House is not only beautiful, it’s also an architectural marvel. Regarded as a national landmark and a UNESCO approved World Heritage Site, the Sydney Opera House’s brilliant location allows the visitor to take in a stunning view of the Sydney Harbour Bridge as well. Go there to see an orchestra or a ballet and you will be able to see and experience an actual performance inside the famous building, in addition to enjoying the dazzling views outside. There’s even an awesome bar under the building if you have a girls’ night out in mind! 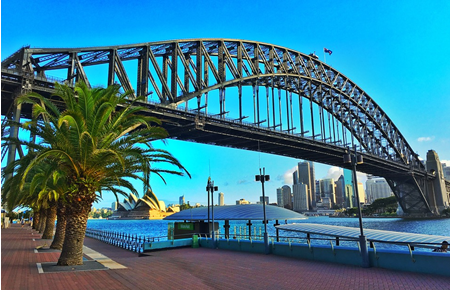 The Sydney Harbour cruises are quite simply an amazing way to indulge yourself a little. Go on a dinner cruise with your friends and enjoy floating on the beautiful waters of the harbour, while being catered with the best selection of local Australian cuisines possible, courtesy of the specialized chefs onboard. The cruises are perfect for bachelorette parties or just a night of relaxation and fine dining. When you step out onto the deck of the catamaran, the beautiful skyline and the iridescent Sydney Harbour Bridge will mesmerize you. Admittedly, it’s not exactly “in Sydney,” but you owe it to yourself to visit The Blue Mountains if you are anywhere near the city. You will have to travel for 50kms to the west of the city to reach the Blue Mountains National Park; a stunning ode to Australia’s natural beauty which is spread over an area of more than 10,000kms! The area gets its iconic name from the fact that a blue haze always seems to hang over the mountains. The entire area is filled with a minty-honey sweet smell which emanates from the Eucalyptus trees that are practically everywhere. In fact, it’s the Eucalyptus oil that mixes with the air to give rise to the famous blue haze after which the mountains and the park are named. There is no lack of touring options here and any one of them will help you to explore local attractions such as the Three Sister’s Rock, Jameson Valley, the Katoomba Scenic Railway and of course, the famous Jenolan Caves. You will find that this list does not mention any beaches and that’s because everyone will tell you about them anyway! Nevertheless, honourable mentions include Bondi Beach, Coogee Beach and the Maroubra. There’s still plenty more to do and see in Sydney, and that’s exactly why you will find this list useful. Check the stuff on this list off and if you have time for more, you can always do more.